Cambridge Scaffolding is one of the most leading scaffolding companies in Cambridge we are operating seven days a week to achieve the best customer service we can offer for our customers. We operate 22 men and six lorries and two small transit vans to get around places where lorries can’t go, to give the quickest satisfactory service. We’ve been operating for over 35 years in the Cambridge and surrounding areas. The company was taken over by new management three years ago. Our aim for 2018 is to provide Cambridge and a 60 mile radius of Cambridge with safe scaffolding and even better customer service, making us one of the only companies around to give you a one-off price to erect the scaffolding and to dismantle it. Just remember, for your next scaffolding project the big pink scaffolding company! Why should you choose Cambridge Scaffolding? 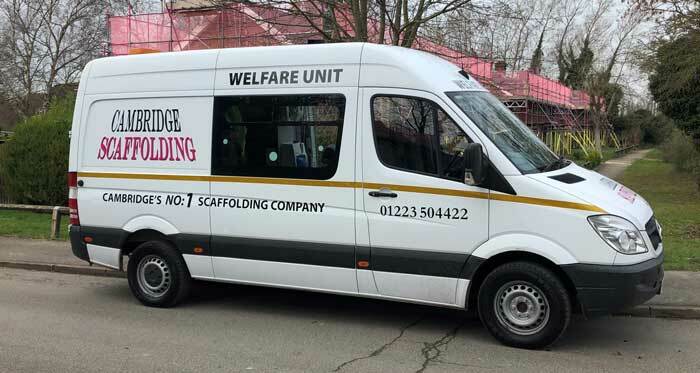 If you would like to request the Cambridge Scaffolding Welfare Unit please get in contact by calling 01223 504 422 or head over to our contact page for more details.